The grease patty is made up of 1/4 cup of vegetable shortening and 1/4 cup of granulated sugar. 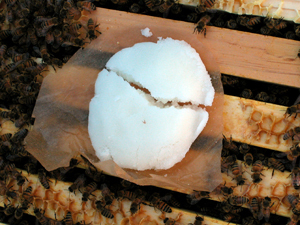 The idea is that the bees climb on it to get to the sugar, but get all greasy in the process. The mites that like to travel from bee to bee to do their dirty work have a harder time getting a grip, and tend to fall off. Plus it's a free meal, right in the middle of the colony! The close up at right is a drone bee, peeking up from below one of the old ApiLife Var wafers before I removed it. The girls in the colony seemed pretty relaxed, and the presence of a drone this late in the season means that times still seem good for them. The workers will eventually chew up and kick out all the drone (male) bees: they are just useless mouths to feed during the winter, when no new bees are raised. 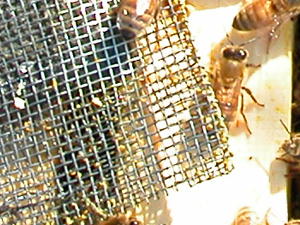 The bees on the left here are raising their Nasanoff gland, located near the stinger, and fanning the pheremone it releases with their wings. The smell guides lost bees back to the colony, but I think it is also a response to becoming alarmed and desiring to have the colony collect itself for purposes of defense. Gloves: I am using them now only because the meds can burn skin. They also come in handy for bad mood bees in August. 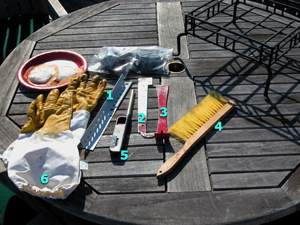 The square metal thing on legs at the right is meant to hold a plant pot, but I use it to hold my smoker while the latter is lit: the outside can get hot enough to melt roofing materials, and THAT is a problem I do not need. 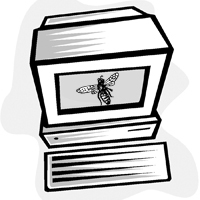 Finally, I wrote another article for the beekeeping club newsletter, and included a little clip art. To an experienced beekeeper, the idea of going online to work with bees might seem like nonsense, but a beginner might find the many online resources for beekeepers — slide shows about how to install a package, photos comparing queen cells and drone comb, discussions about different medications – almost as valuable as [our club's] meeting! This article deals briefly with blogs and why you might want to visit or keep one as part of the apiary experience. The traditional image of a beekeeper in the public eye is of an older guy in a straw hat, somewhere in the country, saying a little and wrangling a lot of honeybees. There is a growing generation of beekeepers who are just as home with a keyboard as a hive tool, however, and many have created online "web logs," or "blogs," to record and share the facts, figures, and foibles of their apiary adventures. Blogs are a lot like diaries or journals, with the small exception that – instead of stashing them in a bottom drawer – the authors post their words and pictures on the Internet and let others take a look. Anything that you see on the World Wide Web can be included on a blog, so many beekeeping bloggers include photos, movies, sound recordings, statistics, and valuable links to other sources of online information. Some bee bloggers make their online site an outgrowth of the normal record keeping they carry out to properly manage their apiaries. Often a blog has numerous entries presented in chronological order, but sometimes it may look like other web pages. Taking the extra step of putting your beekeeping records, ideas, and experiences on the Internet is certainly not for everyone, though visiting such blogs will almost always provide useful information for most of us. Depending on who you are, your bee blog might serve the purposes of informing the non-beekeeping public about the virtues of honeybees, or provide a way to share information about and get help with your own bees. Finally, your blog can just be(e) an opportunity to do something original and creative that will amuse your friends and relatives. For beekeepers concerned with outreach and public information, blogs are an excellent way to combine words and pictures at any technical level. All of us who have ever worked with an observation hive at the Fair can tell you that people are fascinated by how bees look, and that offering answers to a few of the most common questions can fuel a longer term interest in beekeeping. Those of us stumbling around as we learn about beekeeping can use our blogs for something much more pointed: finding out what the heck we are looking at, and whether we are doing something wrong. It may sound laughable, but some of us did not really get a handle on the difference between capped larvae and stored pollen right away, and pest identification is still something of a challenge until you have been through a few seasons. By posting a pointer to your blog on one of the beekeeper message boards, you can get terrific help from beekeepers all over the country in no time at all. 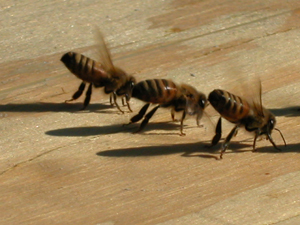 Finally, bees bring out the poet in many of us, and they might even change the way we think. In between the extraction of honey and the application of ApiLife Var, many bee bloggers fit in a few observations about life…and funny photos of family members holding a frame of bees! Sometimes my family gets sick of hearing about my buzzing buddies, but the World Wide Web always has another minute and another page for me to fill. Here are some favorite bee blogs. Every day there are more beekeepers online, however, and there are lots of resources like message boards and agricultural extension sites that offer even more information in other formats. Written by a gentleman who calls himself "Turlough" in honor of a pioneering Irish beekeeper, Propolis is a bee's eye view of the world from across the pond in England. Turlough includes both his opinions on bee management and bee news bits from around the world. He often talks about bees in the community, including relations with anxious neighbors and occasional bee vandalism. He is extremely witty, and strong on beekeeping knowledge. Michael Bush is interested in all sorts of bee gear and management techniques, and his "blog" is actually a very long page full of pictures and discussion that he updates from time to time. Here's a place to learn how to build a Top Bar Hive, how not to insulate nucs for over wintering, and how he approaches varroa control using small cell foundation. This blog does not update continually, but he includes lots of pictures so you can try what he does at home. This Texas beekeeper has managed hives all over the world during his time in the Peace Corps, and has gathered information for suburban beekeepers in particular since returning home (outdoorplace.org/beekeeping/citybees.htm). He has lots of information on a wide variety of management topics, including tips and gadgets. Finally, you can visit my bee blog at http://citybees.blogspot.com: it's a record of my first year as a beekeeper, and any comedy is unintentional. If I had one wish during this year of taking on bees and blogs, it would be that more experienced beekeepers were out there sharing their knowledge of bees past and of current goings-on. There is nothing like experience, and the more local the better, to help spread a good understanding and practice of beekeeping. For all those days when there isn't a [club] meeting, I've always been glad to find the online thinking of seasoned beekeepers.